When it comes to viewers’ taste in male actors, one might say that a different infatuation arises with each generation. As the Chinese entertainment industry has transformed in the past 30 years, it is only natural for the audience’s tastes to shift as well. QQ Entertainment looked at the opinions of a variety of female fans, experienced members of the media, entertainment critics, and directors to come up with six types of male actors that have dominated movie and television screens in the last three decades. In the 1980s, mainland China had just begun to reform and open itself to the outside world. 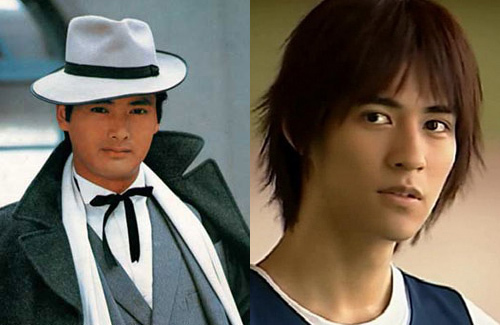 Television dramas from Hong Kong and Taiwan quickly swept the mainland, and the females of this generation became infatuated with stars like Hong Kong actor Chow Yun Fat (周潤發) and mainland Chinese actor Tang Guoqiang (唐國強), all of whom accorded with the traditional Chinese male aesthetic: a square face, sharp eyebrows, big eyes, and a high nose bridge. According to a senior television reporter, square-faced actors became popular because “at the time, viewers liked people who looked upright. Men had to have regular features: thick eyebrows, big eyes, and a tall stature.” Since these actors always played the hero, it was important for them to display a positive image that could inspire hope in viewers. As a result, popular actors never portrayed villains or common villagers, and their heroic image extended to their off-screen lives as well. One entertainment critic remarked, “The idols of that time were put on a shrine. They could not have any flaws. At most, they could smoke and act cool, but once they had a private life, their moral character would be brought down.” Unlike now, when the paparazzi is expected to follow celebrities and report on their everyday lives, management companies then worked hard to ensure that the artists’ images were protected and their personal lives remained private. After the wave of square-faced heroes came a new group of young male actors, most of whom hailed from mainland China. Although they, like their predecessors, played mostly positive characters and maintained a serious and upright image, this new group caught the attention of viewers because they looked more like normal folk and seemed more in touch with people’s needs. Moreover, they possessed solid acting skills, quickly endearing them to viewers. While this new group did not portray traditional heroes, they were still heroes in the eyes of the public – just a different kind. The popular dramas of the time centered on cadre members, soldiers, and policemen. Mainland Chinese actors Pu Cunxin (濮存昕) and Zhou Lijing (周里京), who starred in Hero Without Regret <英雄無悔> and New Star <新星> respectively, became the paradigm for the ideal public service officer. Zhou Lijing was so successful in his portrayal that people would write letters to him, telling him of injustices that he should resolve. One explanation for the emergence of these officer heroes was that audience members became tired of seeing the traditional, square-faced heroes. One television reporter related the plight of mainland Chinese actor Sun Chun (孫淳), who was told he was “too pretty” when he tried out for a role after his debut. “Beauty had become a burden,” the reporter explained. These down-to-earth officers also worked to improve their public image by doing interviews, performing in stage plays, and participating in charity work. Many females were touched by Pu Cunxin’s passion for charity, saying they had seen him on TV, chatting and making dumplings with an AIDS victim. Pretty may not have been popular then, but with a new century came a new stage of entertainment – and a new group of young men. 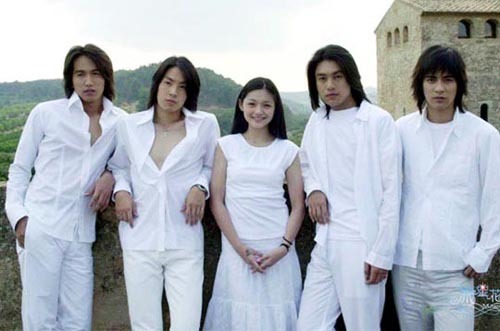 In 2001, all of Asia was swept up in the craze over the Taiwanese idol drama Meteor Garden <流星花園> and its four male leads, known collectively as F4. The flower boy – a term used to describe boys who are as beautiful as flowers, pay close attention to their appearance, and often seem more exquisitely wrought than their female costars – had arrived. Flower boys like Taiwanese actors Vic Chou (周渝民) and Jerry Yan (言承旭) stood out from the previous hero types, not just for their looks, but also because their characters were mostly young men hailing from rich families. Thanks to changes in society and the environment, female viewers were now drawn to wealthy young men who looked like they had just stepped out of the pages of a Japanese manga. Of course, some older women fought against this new trend, saying the F4 boys were nothing like the “real men” of the past. After walking through the first three groups of male actors, do you think “real men” will have made a comeback in the years to come? Or will the trend have continued to favor pretty boys? This is part one of a two-part article series written by Joanna for JayneStars.com. well, i think men of the past such as damian lau was very handsome back when he was young. and san-gor, yum dak-wah. Yeah, I kind of agree……….the more recent and modern men styles all look more on the feminine and “gay” side…..Masculinity is definitely not as visible now……….F4 was a bunch of gay-looking guys. I wasn’t aware that gay people all look a particular way. What a ridiculous statement. There are plenty of masculine looking gay men just as there are plenty of delicate/angrogenous looking straight men. Again, what exactly is gay looking? Do gay people all look a particular way? Can you tell someone is gay by the way they look? And is gay looking and beautiful looking mutually exclusive? Ignore yuaida. Actually, he is homophobic. I have seen him making homophobic comments in jaynestars before. If everyone in this world uses yuaida’s standard to determine how a gay person looks like (gay = feminine), then I guess all asian men, including the macho type, are gay in the eyes of black people, caucasians, latinos, etc. After all, asian people have the most androgynous looks in this world compared to other races. As for Little fishy’s comment, I believe what he/ she meant by ‘gay looking’ was that a particular person gives the impression that he is actually gay. If Little fishy’s gaydar method is effective, then I think 90% of men are actually gay because they give me that impression all the time. Lol. I agree..those poofy looking flower boys are the trend setters from the K-Pop or J-Pop and T-pop.. now the prevailing trend. Very put off from these flower boys. The male aesthetic in dramas has become more segmented. Although there are flower boys, there are more muscular bodied actors as well. It depends on the target audience they are going after. Never got into the Meteor Garden craze or any of the remakes for that matter. I know that a lot of people thought (Taiwanese)F4 were so hot, I just thought they were fug. Their hair were god awful – there are good way to wear long hair, but the middle-parting, limp stringy mess that they were sporting is not one of it. I actually watched the original from Taiwan. It was OK refreshing at the time but I wasn’t crazy over it either. I can not believe even after 13 years, Taiwan is relying on remakes from mangas or cartoons n continue creating even more god awful so called IDOL dramas, I mean it’s like that’s their only market after all these years. I didn’t watch any of the other versions either. I do see clips on utube and know that the jap ver the casting was even more ugly and the korean ver is also weird but perhaps i was biased to the original so never bother w/the other remakes. I totally agree. The hair is awful! I find them to be average looking, not too bad to look at but nothing special. I find that they don’t have the screen presence to keep me interested (or the role did not suit them…?). If you haven’t watched the Japanese version, you won’t know it is awesome and can beat any other versions easily. The look? No, the charisma is important. First, maybe dun get used with their look but they are like stepping out from the manga. Handsome faces fade in front of the true charisma. Original is Taiwan? Are you kidding? The manga is the original! Btw, if you dare to say Shun isnt handsome, I bet you have weird description of handsome. I’m responding to the article which is about the Flower Boy’s look, not about the actors’ charisma. Windy’s comment about the Taiwanese being the original is in the context of them being the first television adaption of the manga, not that it’s the original source material. Again, this is in the context of the article which credited Meteor Garden for making the Flower Boy look popular. I’ve seen the Japanese, Taiwanese and Korean adaptations, admittedly with the liberal used of the FF buttons in the latter two. I liked the Japanese one the best – nice and short and didn’t drag like the other two and I think the actors in the Japanese version were better in their roles as well. The Japanese’s female lead came across as a spunky and naive teenager whereas the Taiwanese one were quite shrill and the Korean one came across as dimwitted. The japanese’s male lead were IMO much better suited for the role of the emotionally-stunted man-child character than his Taiwanese and Korean counterparts. Arg! Please excuse all the grammar andspelling mistakes. I wish there is an edit function on this forum. I enjoyed Liu Xing Hua Yuan and I think many did because it was a more newer trend and was the highest rated idol series. I still enjoy rewatching it from time to time since I am touched by the friendship of F4 and Dao Ming Si’s love and devotion to Shan Cai. Overall, not a bad story/series. I did not like part 2 as much though. I saw the Korean version too and it was ok but I liked the Taiwanese version more. Never gotten the appeal of the “flower boy”. Is that the Asian equivalent of Justin Bieber, 1D, albeit a decade before their time? Nah. Teenage boybands are not exactly a new phenomenon – New Kids on the Blocks, Backstreet Boys, N’Sync – they’ve been around way before the Meteor Garden craze. There might not be an equivalent movement or a particular name for the Flower Boys in Western media, but appreciation for pretty boys look do exist. Think Johnny Depp during his younger 21 Jump Street years or Orlando Bloom – androgenous, delicate looks as oppose to the more masculine features ala Brad Pitt for instant. Also, I can see why Korean F4 were considered Flower Boys, but the Taiwanese F4 really isn’t “pretty”. Even if a person find them atractive, they really doesn’t fall into the pretty, delicate, boyish mold of Flower Boys. Teenager boybands might not be a new phenomenon but I don’t think think Backstreet Boys, N’Sync etc. were particularly feminine looking. Johnny Deep and Orlando Bloom are androgynous looking because they have very “pretty” features but I disagree that they are delicate. There has been Asian boybands too like Little Tigers, Beyond etc. and they usually have a mixture of types. Whereas those flower boys all seem very similar to me. And Justin Beiber is not a Flower Boy. He’s a fugly little punk. He wishes he was pretty enough to be a Flower Boy. Frankly I thought he was a girl! Funn, he may looks like a girl, but he sure as heck isn’t pretty enough to be a Flower Boy. At most, he’s cute in that prepubescent way, but Flower Boy pretty? Nah. This is all just my opnion of course. I’m sure his teenage fans all think he’s the prettiest pretty boy ever. He looked very girly in his pre-pubescent days. Just because he got a better haircut and a bunch of tattoos doesn’t make him more manly or punk looking. I’m sure lots of people would disagree that those flower boys are pretty so it’s kinda subjective isn’t? I don’t think Bieber is good-looking, but I do think he had girly features. Like I sai, girly alone does not a Flower Boy made. And I did say that it is strictly my opinion that Beiber is not pretty enough did I not? Also, I’m not using “punk” in the way that you are interpreting it. Your statement that just because he got some tattoos doesn’t make him punk is exactly what I mean. He’s a poser. The poser that acted tough, but would cry if they get so much as a hangnail. Google it. Oh, I know the article doesn’t say flower boy = girly looking man, but IMO that’s what all those termed flower boys are. They are certainly not manly or good-looking to me. You get particularly defensive about it so I can’t be bothered to argue if Bieber is girly or a punk. they were pretty hot in 2000-2004 (f4) that’s how the fashion was back then. Those in their teens, early 20’s or mid 60s may go for Flower Boy look (some pervie mid 60s people do like they boy toys or plastic girls). Those mature audiences would prefer a manly (macho) square-faced-hero to fight their battles or give them a good sense of security. Down-to-earth officers are good as backups and offer a shoulder to cry on when required. Unless Square-faced-hero or Flower Boy is dead, these types usually do not end up with the girls. If they do, they would either end up as villains or be chivalrous enough to accept rejection if the assumed dead beau of the girl turns up alive. So to guess which group would make a comeback – it depends on which age group is being targeted. Not sure I recognise any of the Down-to-Earth Officer sentiment at all? Must have been a purely mainland thing. TVB has never had many hunks on offer (nowadays even more so with the Uncle wave). I suppose Julian Cheung and Louis Koo belonged in the 90s Flower boys category. I’m born in the 90’s and I should be drooling over those flower boys, but I have to say I like me some macho man. I want my man to be mentally and physically strong, so I can have some sense of security. Which is why I miss that era of “real men.” I mean it’s not like “real men” don’t exist anymore in Chinese cinema lol, but they sure aren’t THAT popular amongst youths. I’d LOVE to see “real men” make a comeback, but at the rate in which we’re going, seems like “flower boys” will remain dominate in the years to come.